Kydex® is perhaps best known as the product out of which aeroplane seats and overhead lockers are made, but it’s antimicrobial properties give this versatile material a far greater range of purposes. 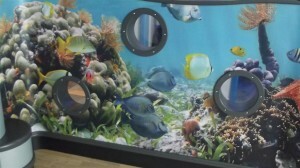 Leisure Technique have not been afraid to push the boundaries making headways into the Healthcare Sector and the Leisure Centre Industry. Having been involved in a number of projects with ISG Regions, Leisure Technique was instructed to design and manufacture 4 unique Reception Desks as part of the £5m Deeside Leisure Centre refurbishment. The design and materials used in the construction of the desks had to be robust enough to cope with the extreme environment. Although a standard HPL laminate was used on a number of low use surfaces, some of the materials needed to be robust enough to withstand the wear and tear of this extreme environment, yet look sleek and contemporary. Amongst some of those materials used is Kydex®. Developed in 1965 Kydex® has been in use now for over 45 years in the aviation industry and has been used for seat backs, walls, overhead lockers and trays onboard aircraft. It is a thermoforming alloy that provides an extremely durable surface that can be formed over intricate shapes which is not possible with standard HPL. It is also environmentally friendly and can be recycled. This material is also NSF/ANSI Food Safe, Class 1/A fire rated and has an extreme resistance to impact, chemicals and abrasion. Leisure Technique has embraced this material and developed unique manufacturing technique’s that has allowed Kydex® to be used in retail and commercial environments. One such success is the luxury nursery brand Mamas & Papas, where Kydex® coated furniture is now installed in all new and future store designs. 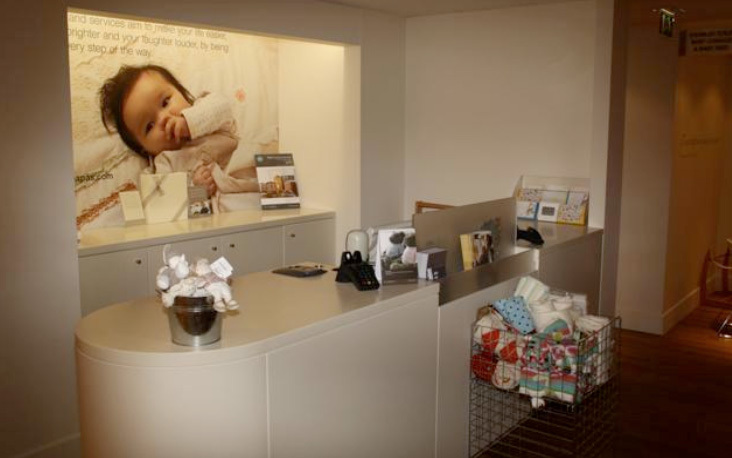 With escalating maintenance costs and an awareness of environmental issues, Mamas & Papas embarked on a review of materials used to manufacture their retail displays. Leisure Technique and Kydex® has transformed Mamas & Papas and has not only proved to be an usual cure for escalating maintenance costs, but has also allowed them to address the ever growing concern on environmental policies. Kydex® shelves, plinths and complex mid-floor unitary, as well as Kydex® coated Fire Doors and frames, are now a standard product in all their new stores. Kydex® has also been used in an exciting new project with the NHS. Like many healthcare organisations across Europe, The Hull NHS Foundation Trust needs to deliver carbon reductions, save money and at the same time provide environments that are built around patient needs. Kydex® is been extensively used to help attain these needs at the Royal Infirmary in Kingston Upon Hull. • Window Reveals – Greatly enhances the transition from inner frame to wall and so makes the sill and wall cladding a seamless item. This alone is almost a yearlong project to replace all the window reveals at the Hospital. • Integrated Panel System – Our IPS Units can be found in a wide verity of places around the NHS from the New CT Department, Ward areas, the new Emergency Department, Urgent Care and heavily trafficked areas such as the main entrance foyer at the Hull Royal Infirmary. • K.WaC Protection System – Our Kicker, Wall & Corner Protection System has been designed to keep high traffic areas looking as new as the day it was installed. The NHS has embraced this system and is currently specifying it to enhance existing older areas as well as being standard fitment to new departments, such as the paediatric and adult Emergency Departments. 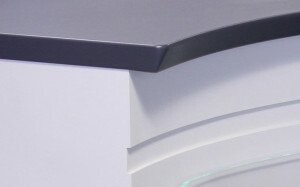 • Workstations & reception Desks – These are being installed in select areas where a new clean & fresh look is paramount. There are quite a few benefits in using this material, the biggest one is it’s antimicrobial properties. All of the above products are encapsulated in Kydex® as its antimicrobial properties are assisting the NHS in the fight against infectious outbreaks and the spread of contagious conditions. KYDEX® sheet was subjected to fungus resistance testing in accordance with ASTM G-21 and bacteria resistance testing in accordance with ASTM G-22, Procedure B. Testing was performed by Truesdail Laboratories, Inc., located in Tustin, California. The KYDEX® sheet samples did not allow any fungus or bacteria growth. To view the range of Colour Swatches please click here. We pride ourselves on our customer focus and delivering solutions efficiently, effectively, within budget and time constraints. Our standard of Production, Quality, Innovative Ideas, Customer Support and Reliability have made us market leaders in our field.